The Call to Worship was made by Dermot, who led our Worship today. Sharing of the Notices: Malcolm told of the Australia wide launch of the “Eat Like a Refugee Challenge” where last Sunday night, thirty people shared a frugal meal in our church hall, listened to two speakers from “Act for Peace” and raised around $1,200 to help the more than 100,000 people who live in nine refugee camps on the border of Thailand and Myanmar. Everyone was invited to stay for the Friendship Circle Morning Tea of home made soups and fresh bread rolls and we enjoyed the inviting smells that wafted through the church as the service continued. Prayer of Confession Dermot provoked our thoughts by talking of the nine lives of a cat and asking; “How many lives do we need?” Although God breathes life into us and gives us every chance to accept and follow him throughout our life, we are sometimes “ridiculous” - and the way we “see ourselves” takes us away from God and our commitment to Him. Dermot’s prayer invited us to think of our lives as a beautiful green lawn riddled with onion weed, which has grown there because of the way we “use our lives.” We prayed for God to help us to discover and remove the roots of the weeds. Any of us who have ever had onion weed in our lawn will understand the depth of this plea! Offering / Prayer Pat and Bob were helped with the offering by two of the children and our gifts were blessed. Children’s Address: Dermot told a story of two brothers, with the older one being the selfish Duke and the younger one, with no real authority, being a hard worker for the good of his brother’s subjects and the dukedom. This story presented a thought provoking message on “self imprisonment” that can come about if we make poor choices. The younger brother simply provided a comfortable home with an abundance of excellent food for his brother, whose weakness and selfishness made him increasingly fat and lazy and soon lost him his dukedom. His younger brother did not imprison him – he imprisoned himself - and his younger brother became the duke in his stead. Hymn 422 "Blessèd assurance, Jesus is mine!" Fanny Crosby who wrote this much loved hymn, wrote more than 8,000 hymns - probably more than any other hymnist in history. The gift of offering praise and thanksgiving to God through her hymns made Fanny one of the best known women in America and on her 85th Birthday, the American president Grover Cleveland paid tribute in a letter to Fanny. “My dear friend, It is more than fifty years ago that our acquaintance and friendship began; and ever since that time I have watched your continuous and interested labour in uplifting humanity, and pointing out the way to an appreciation of God’s goodness and mercy”. And this morning in our little Australian Church 99 years after her death at 95 years old, we were again uplifted. “Blessèd assurance, Jesus is mine! O what a foretaste of glory divine! Bible Reading: Romans 6:1-11 (page 876) Read for us by Marcia. “Have you forgotten that when we were baptized into union with Jesus Christ we were baptized into his death? By baptism we were buried with him, and lay dead, in order that, as Christ was raised from the dead in the splendour of the Father, so also we might set our feet on the new path of life.” This affirmative reading is both assuring and challenging and should inspire us to be “Alive to God”. “Our shared Faith should lead us to be dead to sin.” “Holiness is to live the life of Christ.” This means that we are to abandon sin and live our lives in a way that reflects we are God’s people. We can do this with the assurance of his promise of eternal life, because he died for our sins - and because he rose again, we can have the gift of His Grace to be a buffer against our imperfections. Without God’s Grace we too would speak the “Language of Death” – as spoken by the slave Spartacus in the movie about his life as a slave. Spartacus said; “Death is the only freedom a slave knows – that is why we are not afraid of it.” But as Christians we have the opportunity to life our lives in freedom through God’s Grace and we have also come to understand that some of the earlier religious protocols were more harsh, because of fear of diminishing the influence of sin. Dermot cited this as the reason for the earlier unequivocal belief that even a new born baby must be baptized to save the child from dying in sin. 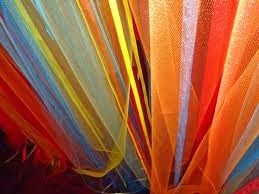 The message that I heard was; “Baptism is being immersed or overwhelmed in water – baptism is also being immersed or overwhelmed in the spirit – it is being overwhelmed by the love of God – it is being grafted into Christ and being united with Christ.” I wonder if this was the message other people in the church heard? Did I hear the complete message? Dermot did say directly; “The key is for us to desire only that which is in the nature of God.” And he challenged each one of us about the depth of our commitment. He also acknowledged that we are human and sometimes experience a struggle to accept the Grace of God because of our interest in self. Caroline Maria Noel was the daughter of an English Vicar and niece of hymnist Baptist Noel. In her middle years she suffered a long and serious illness which left her an invalid. But it was then she began her most productive period of writing and sharing her trust in God’s love and power. Prayers of Intercession: Grahame led our prayers for the people of the World this morning. He prayed for support for all people throughout the world who work to aid refugees and all people in need. He also prayed for those people who lack other blessings we have, things like a home, a job, friends, good health and healthcare and an education. Then we prayed for the people mentioned in our “red” books that had been passed through the congregation before joining together in the Lord’s Prayer. This “Battle Hymn of the Republic” is much loved by our enthusiastic Marsden Road Church people who take it as a challenge to be heard above Grahame’s enthusiasm at the organ and we always ensure we “win” the contest. Grahame’s fervor has helped make us into much better singers than we would otherwise be – thanks to him for more than 45 years of service at the keyboard, helping us in our Worship. The Benediction & Blessing We were sent out by Dermot - to “Go with God and discover new life in Christ.” We sang one of our favourite farewell songs; “Now unto Him, who is able to keep, able to keep you from falling.” Amen. A special thank you to the musicians, the people who decorate the church, and all those other people who are rostered onto the various jobs that keep the service humming. Remember, Christian Worship is both God's gift to us and our offering to God. the Holy Trinity of Hope and love. and no time when you are not there. And shows us that life is stronger than death. in which we are surrounded by love and grace. For there is no other God like you. Prayer of Adoration and Confession. Leader: O God who meets our every need, who heals our wounds and who can restore us to the fullness of our humanity; we give you thanks for your greatness and your love and light that illumines this dark and broken place in which we live. We confess before you our many sins and all the times we have not sought to show your love to the world. All: For all these transgressions we beg forgiveness, Lord. All: Sisters and brothers, our sins are forgiven. Be at peace. Thanks be to God. HymnTIS 430 "Your Words to me are Life and Health". Lyn led us again, singing of the effect of God's message in our lives, restoring and healing us. Amen. The reading from Psalms spoke of God's creative majesty, while the Matthew reading recounted the sending out of the disciples to take up the work of Jesus. 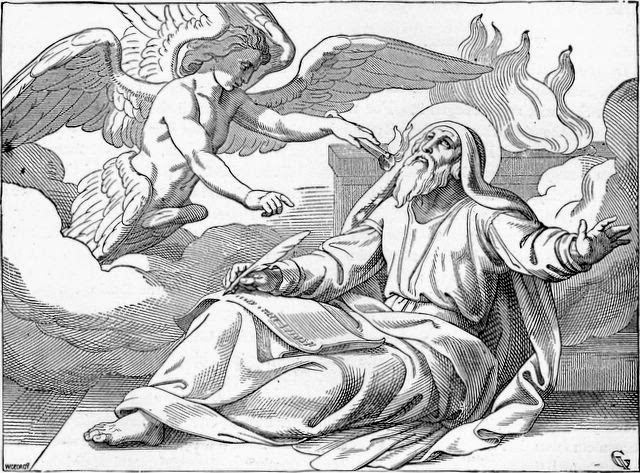 Isaiah 6 was an account of "Isaiah's Calling" and his realisation of his need to respond to God's message to go out and do His work in the world. Reflection. Margaret spoke on Isaiah 6 and of Isaiah's experience of being confronted by God in the Temple, with a Seraph calling out, "Holy, Holy, Holy is The Lord of hosts; the whole earth is full of his glory.” The experience was so overwhelming that Isaiah was struck with his own and his people's fall from following God's path for them. His own sinfulness cleansed he heard God's asking "Who will go for us?" And Isaiah, totally shaken by his experience could only answer, "Here I am Lord; send me!" Hymn TIS 658 "I, The Lord of sea and sky". The logical response to the reading from Isaiah and the reflection. Here I am Lord! We thank you for your care for us and pray that we will be strengthened in sharing that care with others - showing them your love. We pray for those in need all around the world that you will move those that can, to meet their needs. We pray for our governments in Australia that they will see their role as serving and caring for the people of this land. We pray for the church everywhere, especially here at Marsden Road, week by week as we seek to find a new minister. People: Keep your words in our hearts as we go forth into the rest of today and this week. Leader: At every point may we be saying "Here am I Lord, send me". People: Take away our hesitation, Lord, take away our anxiety. Hymn TIS 609 "May the mind of Christ my Saviour". The only way any of this can happen. Hymn TIS 778 "Shalom to you now...shalom my friends". Lyn. Hugh welcomed us to Pentecost Sunday, reminding us of the events of that day that changed the lives of Christians everywhere and for all time. He then invited us to worship God in that Spirit. Hymn TIS 390 'Alleluia alleluia' Praising God for his great gifts which will give new life to all - just as we are. People: enable us to be still and know that you are God. People: breathe in us Your Holy Spirit to strengthen, comfort, and guide us in the midst of the storm. People: that we might become makers of your peace in our homes, in our communities, in our world. We humbly beg you to forgive us now as we confess our sins before you. Hugh then spoke of all those wrongs we commit against each other and write off as "human nature". They are "human nature" - wrong human nature. For all of them we begged forgiveness. Hugh then assured us that the Son of God came into the world to save, not condemn, to forgive, accept and uphold us. He then declared: Our sins are forgiven. Our younger members gathered the offering which Hugh dedicated for use in God's Kingdom. It's lovely to see the kids taking an active role in our services. Hymn TIS 643 "I want to walk as a child of the Light." In God there is light and in him we can be freed from darkness. Just by asking. Bible Readings: Marcia read to us from Genesis 11: 1 - 9 and Acts 2: 1 - 21. The Genesis story is of a group who built a city and a tower going up to Heaven. The Lord, seeing this, and thinking they were becoming too powerful and independent, scattered them and confused their language so they could no longer understand each other. A story to explain the existence of the many languages in the world but reducing God to some being who could be threatened by the power of people and therefore, in my book, a myth rather than history. The Acts reading records the event of Pentecost, when the Holy Spirit entered the disciples, filling them with confidence and insight and joy that they had previously not known since Jesus was with them. Their behaviour made their neighbours think they were drunk but Peter assured everyone, saying a new era had arrived. Hugh told the story of the Tower of Babel and how its destruction was an act of kindness in as much as it turned the people on the true path to God. He pointed out that in a like manner we need God involved in our lives to keep us living in the right way and on the right path. Which is why Pentecost is so important - because God's Spirit guides our words and causes us to be able to communicate to others God's message of love. When we speak the Good News to anyone, we are not alone - the Spirit works through us. When we act as a Good Samaritan, we are not alone. The Spirit works with us and through us. Hymn TIS 412 "God sends us His Spirit" Our Spirit Friend who guides us and frees us, creating a new person in us, leading us away from darkness. Hugh led us: O God, the creator and preserver of all, we pray for all people and especially those in any kind of need through famine, war, or natural disaster. Make your ways known upon earth, O God, your saving power among all peoples. Help us to lighten their burden and to seek justice and peace for all in words and actions as your Kingdom people. Guide us by your Holy Spirit, that all who call themselves Christians may be led into the way of truth and life of Jesus Christ. Strengthen your Church, especially this church, Marsden Road Uniting Church, and all its leaders and servants in their service of Christ and the community. God of love; grant our prayer. Comfort and heal all those who suffer in body, mind, or spirit. Give them courage and hope in their troubles, and bless those who care for them. We also remember in this prayer those who have died in Christ, grant us with them a share of your eternal kingdom that we will enter. God of love; grant our prayer. Give grace to us, our families and friends, and to all our neighbours that we may serve Christ in one another and love as he loves us. God of love; grant our prayer. This was followed by The Lord's Prayer. Hymn TIS 420 " Holy Spirit go before us" Asking for the Spirit's guidance not only for us but for all we meet. Sometimes I pray that they won't hear so much of me but that God's message of love will be heard over anything I may say or do. "May the feet of God walk with you." Here, today we are in God's presence. God is with us wherever we may go but when we meet together in church it is a special time because we meet as one. HymnTIS 130 "We plough the fields" A song centred on farming matters - to be taken literally or metaphorically - praising God for his hand in all the work we carry out; using it for his purposes. Our Heavenly Father, we come before you this morning to praise and adore you, the architect of the soaring, majestic, intricate, beautiful creation. We praise you because you help us grow, heal us, mend us. You can see inside to every scar, wound, hurt - every shameful memory - we praise you for the comfort and strength you bring us; for your grace and guidance. We thank you for this congregation and the community of all believers. We confess that we have sinned in so many ways against you and for this we beg forgiveness. In Jesus name we can say, "Our sins are forgiven". The Offering was then collected as an extension of our worship and offered for God's work around us. Hymn TIS 693 "Come as you are" A gentle, warm invitation to all. God knows us better than anyone else does and loves and welcomes us just as we are. Bible Readings Psalm 68: 1 - 10, John 17: 1 - 11 read by Pat. The psalm, praise to God, singing of his mighty power and expressing faith in him to right all wrongs. The words from John, a prayer of Jesus for his disciples now that they were going to have to carry on his work. It becomes a prayer for us, the ones left with the mission to carry on Jesus’ work on Earth in this time. Something to give us great confidence. Hugh spoke of the dissent and disagreement between Christians and reminded us that Australia, India and Canada are the only countries where churches have united. He spoke of the alienation felt in developed countries and of the accompanying suicide rates brought about by structural loneliness. Structural loneliness brought on by "being ourselves", by privacy, by protecting ourselves and our property. Hugh spoke about unity, explaining that the disciples understood the idea very well. They were all Jews, with the same heritage, the same forefathers, with the same cultural tradition, they understood unity well. However, when Jesus stepped into the scene that unity came to include all. "One thing is crystal clear here. Jesus wants to introduce God to us so that God's love for him may be in us too...Jesus made us one with himself by loving us as God had loved him." 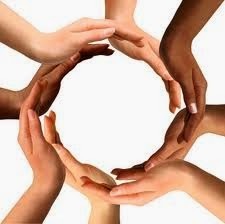 By this unity among us became possible. Ruth prayed to the Almighty Loving Father, giving thanks for being able to approach God to give thanks for all our blessings. She prayed that those affected by all the sirens we had heard during the service would have a good outcome, then thanked God for the rain and asked for peace throughout the world, praying that those who do not honour God will see the truth. She then prayed for the personal concerns of the congregation and asked us to join in the Lord's Prayer. With that, we offered the sign of peace to those around us in the service. Hymn TIS 491 "Father welcomes all his children" again, a song, speaking of God's welcoming invitation to all, not just the good or the deserving but everybody. Take up the invitation. The Bread: It will become for us the bread of life. 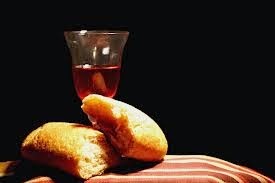 The wine: It will become for us the cup of salvation. The Spirit of the Lord is with you. Father, we give you thanks and praise through your beloved Son Jesus Christ your living Word. You have created all things through Your Son, our Saviour. By the power of the Holy Spirit he took flesh; born as a human, he lived on earth and went among us; he opened wide his arms for us on the cross; he put an end to death by dying for us; and revealed the resurrection by rising to new life; so he fulfilled your will and won for you a holy people. Holy, holy, holy Lord God of power and might, Heaven and earth are full of your glory. Hosanna in the highest. Blessed is he who comes in the name of the Lord. Hymn TIS 647 "Comfort, comfort, all my people" God who can mend each hurt. Take each wound to him who is faithful in healing our pain. May the Lord walk beside you to comfort you. May the Lord walk above you to watch over you. May the Lord walk behind you to keep you safe. And the Lord walk before you to show you the way. And the grace of our Lord Jesus Christ, the love of God and the Fellowship of the Holy Spirit be with you all, now and forever more. Retiring Hymn: May the feet of God walk with you. And a special thank you to Grahame for his ministry of music each week.